Both my mom and my mother-in-law are breast cancer survivors and 2 of my favorite people in the world! Last October I was able to run a 5k with my mother-in-law when she finished radiation to support breast cancer research and on May 10th I get to run/walk the Susan G Komen 5k with my mom! My mom picked this race because she participated in a research study while she underwent treatment. The research doctors were at each of her surgeries and appointments and she knows firsthand how important the research is. If you are in the DC area we would love to have you join our team and walk with us! If not, we would greatly appreciate your prayers, positive thoughts, and donations to research if possible. You can check out our page HERE. This week I threw my name in the ring to be part of Saucony’s 26 Strong project. Saucony pairs up 26 veteran marathons with 26 cadets (or first time marathoners) and together they train and run a marathon this year. I first followed the project when NYCRunningMama was selected as a coach last year. As you can tell, Saucony is the inspiration behind my blog and the maker of some of my favorite shoes! To make it even better, a local DC area coach whose blog was the first running blog I followed, Mile Posts, was selected as a coach for 26 Strong. There are so many amazing and inspiring applicants so I am trying to not get my hopes up too high – but I would be SO stoked if I won it! I met all of the criteria (having run a half marathon, no injuries, etc.) and find out on the 17th if I made it. Only 26 do…AHHH!! I often watch these Saucony ads when I need a little pre-run inspiration (it works) and thought I would share. The second video is actually Mile Post’s Saucony ad! Marathons have been on my mind (hello, 26 Strong Project) but so have triathlons. 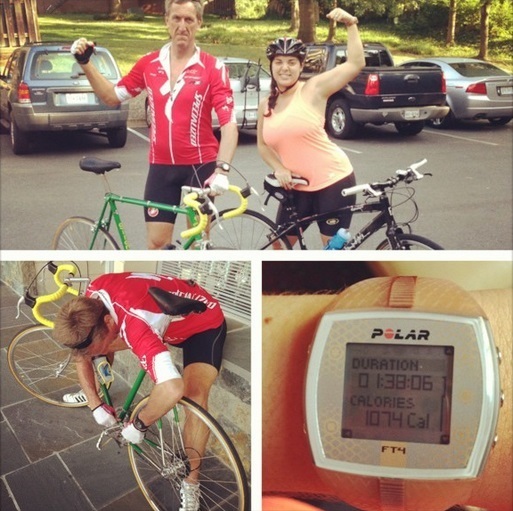 My dad is a triathlete and I’ve been feeling a strong tug towards more distance biking and triathlons. Right now I am very overwhelmed with the sticker shock of road and tri bikes because my hybrid bike is not going to cut it…especially if I need to keep up with my dad! My dad needs a biker buddy when he moves back here in July and I want to add biking in as cross training…so I am hoping he will help me out with a road/tri bike! Right now I am in the research phase and would love any input from triathletes on entry level tri/road bikes that won’t break the bank. The only bike I’ve test-driven so far is the Specialized Dolce. I loved it, but I am open to suggestions. Until then, I am pinching every penny so I can make this happen! Easter is (almost) here! God is good! I am very thankful my boss gave us off for Good Friday and Monday to celebrate. It was wonderful to sleep in a little today and I am really looking forward to baking a ton, cooking Easter dinner with Max, and celebrating Easter. This is our first Easter without our parents near by (mine are in the Philippines and his as in Missouri) so we are cooking a feast for two this year! On Saturday my sister and some friends are going to a tapas lunch and watching Heaven is for Real. We lived in Spain for 4 years so Alicia and I will jump at any chance to drink sangria and eat paella! Gift giving is definitely one of my love languages and over the last 2 weeks I have made 3 Easter baskets (one of Max, one of my sister-in-law Natalie at college, and one for our friend Tim). I love making them and can’t wait for people to enjoy them. I’ll post pics after the Easter Bunny visits because I don’t want to give any secrets away! KT tape. Every heard of it? I don’t have any injuries but everyone has the occasional ache or pain. When these aches or pains flare up I love to help them out by using KT tape. Think of it as a tape brace! I use it on my hips, IT band, shin splints, knees, everything! I was first introduced to a KT-tape like product in high school when I dislocated my shoulder but needed to tape it down to play volleyball. I’ve been “stuck to it” ever since! This weekend I wrote out a message on my tape as a reminder to offer up the pain or struggle of running for those who can no longer run. 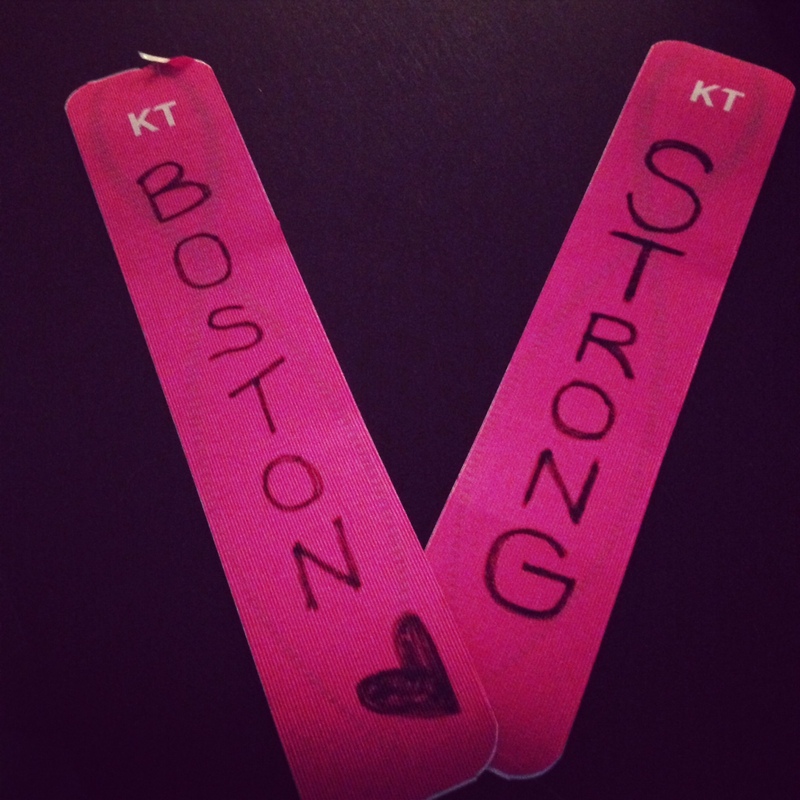 We are all #BostonStrong this week! I absolutely love the videos you put up! It’s really motivating for me, as runner myself. 🙂 Thank you very much for sharing! Saucony makes some great ones! That’s really great that you were able to do a 5K with your mom-in-law. I hope both your moms are well. I use KT when I remember to! Great videos! Happy Easter! Thank you! I am so excited that I get the chance to run one with mom and feel so lucky to have been able to complete one with my mother-in-law as well. They are truly strong women! And I’ve got KT Tape on as we speak. Have you ever kept it on for multiple days? I’m trying that out today. Thank you! I will have to take a look 🙂 I saw the notice! You are too kind! I have several Saucony’s I have run in because I love, love, love them all. Right now I am running in their minimalist Mirage 4. So light weight!